Couple of days ago I was solicited to take a look at a new offering by PostRank called... PostRank Analytics! The service is pretty clever and offers insight into your blog performance by merging social media measurement and quantitative data. 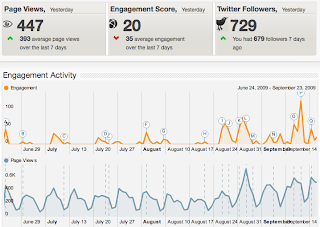 The graph bellow shows an overview with timeline, indicators when you posted on your blog, and overall stats. Clicking on one of the post indicator leads to a more detailed report. Learning how your content is performing with your audiences, improving your blogging, and developing relationships with your readers should be as important to you as to larger media outlets. But web analytics itself, such as Google Analytics, isn't adressing very well the social media aspect of your blog performance. This detailed report shows individual posts with indication about the relative PostRank Engagement index, page views, time on page, and number of mentions in several social media outlets such as Twitter, Digg, Delicious, Reddit, etc. For individual posts, you also get all Twitter mentions. Basically, PostRank Analytics allow you to better identify when, where, and how your audiences are engaging with your content, not only in the last week or month, but also today. It will help you find readers on all the important social hubs where they consume, organize and share content. You can not only see overviews of your audience engagement activity, you also see it as it happens, enabling better connection for timely conversation. A very interesting service worth giving a try. With so many data sources and different ways to look into social media and general web analytics data, PostRank Analytics provide an easy to use and pretty complete picture. Even if only $9/month, my worry is the number of clients willing to pay for a service that gathers data readily available for free from different sources, and particularly when so many bloggers are relying on a collection of free tools. Still, the insight and visualization is pretty useful, and serious bloggers should at least give it a try for a month (for free! ).